Horror Sci-fi and More! : FILM MODE ENTERTAINMENT DEBUTS "THE NINTH PASSENGER" AND "BLOOD BOUND"
FILM MODE ENTERTAINMENT DEBUTS "THE NINTH PASSENGER" AND "BLOOD BOUND"
Blood Bound starring Eden Brolin ("Beyond"), Joseph Melendez ("Ozark"), and Emmy-Award Winner Eric Nelsen ("The Bay"). Clay Epstein's Film Mode Entertainment announces the World Market Premiere screening and AFM debut of the new thriller The Ninth Passenger. The film stars Jesse Metcalfe ("Dallas") as well as a talented ensemble of veteran and up-and-coming actors that include Tom Maden (MTV's "Scream,"), Alexia Fast ("Manhattan"), Timothy V. Murphy (The Lone Ranger), and Cinta Laura Kiehl (After the Dark). 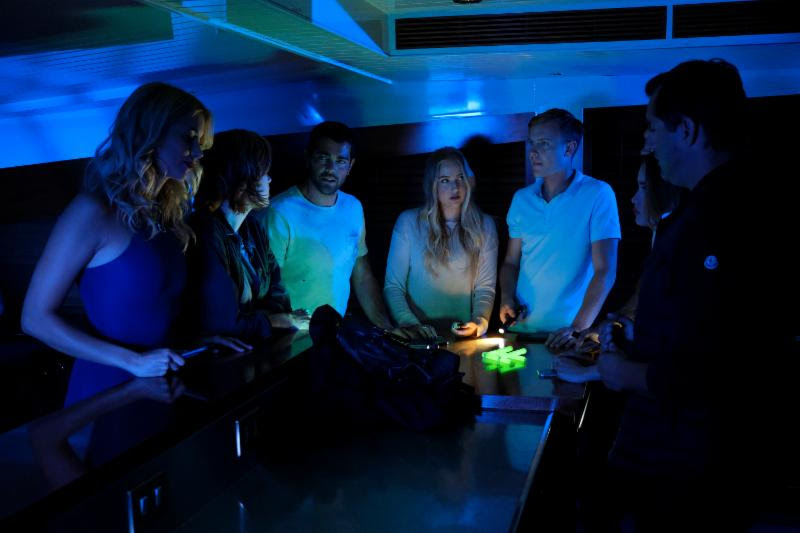 From the executive producer of It Follows, Corey Large, The Ninth Passenger uncovers a group of college students on a spontaneous midnight sea voyage aboard a luxury yacht. The adventure turns horrific when they drift to a dark island and are hunted one by one by a mysterious ninth passenger. Not everyone is what they seem in this spine-tingling excursion. "Audiences are going to have a lot of fun with The Ninth Passenger. The filmmakers have made a really entertaining film with great characters and great twist at the end," said Epstein. Stay for the AFM World Market Premiere of Blood Bound starring Eden Brolin ("Beyond") daughter of multiple award-winning actor Josh Brolin, Joseph Melendez ("Ozark"), and Emmy-Award Winner Eric Nelsen ("The Bay). The film is written and directed by Richard LeMay, who recently directed Dimentia 13, originated/funded and owned by NBC/Universal. Every 25 years, it begins. Bound to an ancient pact, a family of unlimited power descends upon a small rural town to sacrifice four human lives, one being a member of their own family. This Rosemary's Baby meets Drag Me to Hell thriller takes a dark look into how far the human spirit can take one soul in it's most desperate hour. Layered with plot twists and conflicted characters, Blood Bound follows six people as they carry out their destiny to their ultimate horror. "Blood Bound is the perfect addition to our already impressive line-up of films." Said Mathilde Epstein, COO of Film Mode Entertainment, "We are quickly becoming the home for elevated genre films as evident in our success with films like The Good Neighbor starring James Caan. Our roster consists of a variety of these commercially viable titles that buyers and audiences around the world the world have been asking for." "I'm thrilled to be working with Film Mode to screen Blood Bound at AFM," said Richard LeMay, writer/director of Blood Bound. "This is a great opportunity to show people this dark, creepy film, and I think people are going to be blown away by Eden Brolin's performance." Film Mode Entertainment is a leading worldwide sales agent, production entity and distribution company, focusing on commercially driven feature films of all genres and budget sizes. Film Mode represents projects at all stages of the filmmaking process, often as Executive Producer, with the aim of helping producers and distributors achieve maximum exposure for their films. Film Mode's recent successes include Sugar Mountain starring Jason Momoa, Little Pink House starring two-time Academy Award-nominee Catherine Keener and the SXSW official entry The Good Neighbor starring the legendary James Caan.